Jan. 6th - Fat Tuesday, Feb. 28, 2017. Bring some fun into the winter months by celebrating Mardi Gras. 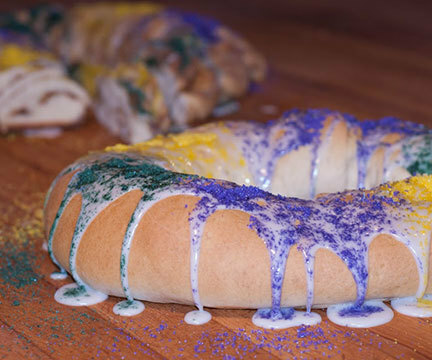 We will be baking King Cakes every Thursday and Friday starting Friday, Jan. 6th. No Mardi Gras celebration is complete without a King Cake. The pastry is thought to have originated in France in the 12th century. The circular cake with the hole in the middle represents the circular route the kings took to prevent King Herod from finding baby Jesus. Traditionally the Mardi Gras King Cake is baked with a small plastic baby hidden inside. The person who gets the baby in their piece of King Cake is expected to provide the next cake (or throw the next party.) Get in on the excitement. Do it every Friday at work or throw your own party with your friends and neighbors. We will make the King Cake every Thurs—Fri. starting Jan. 6th ending Fat Tuesday, Feb 28th. Each King Cake is decorated in the traditional Mardi Gras colors of purple (justice), green (faith), and gold (power), and comes in a festive box along with 3 coins, 3 strings of beads, and a plastic baby figure to hide in the cake.